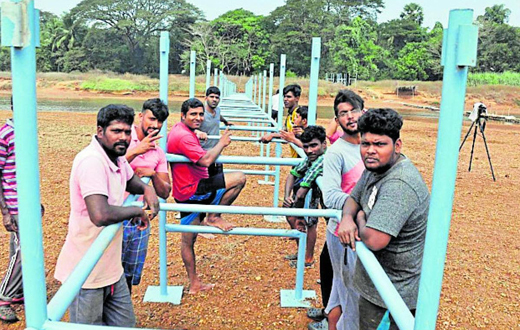 Manaluru, Jan 27, 2019: The people of Pavoor Uliya, constructed a temporary bridge with the help of donors to provide day to day communication and connectivity. The initiative has been taken even as governments and authorities in the district failed to fulfil the residents’ vital needs for a bridge. In the absence of surface transport, rowing boat has been the only mode of transport for people from both sides of the river. Danger lurked when River Nethravathi swelled mainly during monsoon. Pavoor Uliya has a 50-year-old Infant Jesus Church with 40 families living in the village. Majority of the residents eke out a living through inland fishing and farming. 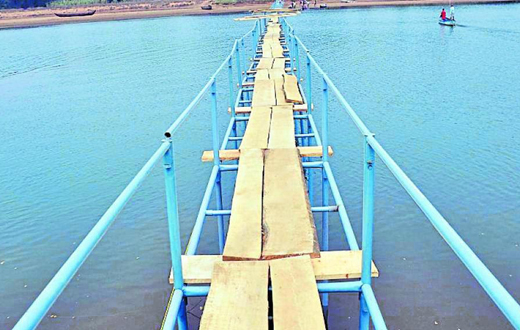 The residents have to cross the river to reach Adyar, which is situated nearly 8 kilometres away from Mangaluru. A few years ago, barring monsoon, the residents were crossing the river without any problem to reach Adyar during monsoon. They were using wooden logs or sand bags during the low tide to cross the river. Due to rampant sand mining, the problem increased with an increase in the depth of the river. As a result, the residents had to use the service of boats even during summer. The residents, under the leadership of Church priest Rev Fr Jerald Lobo had submitted an appeal to the district administration and the elected representatives for the construction of a bridge. 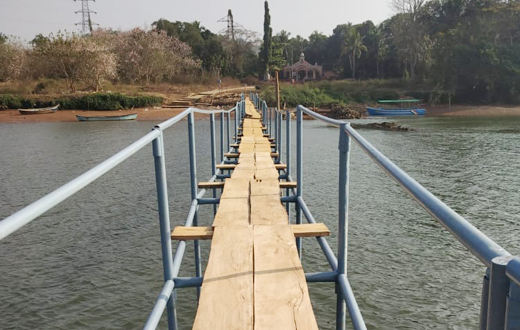 When the demand fell on deaf ears, the priest and the residents raised fund from donors and finally built 300-metre-long temporary bridge when the Church celebrated its golden jubilee in 2018. 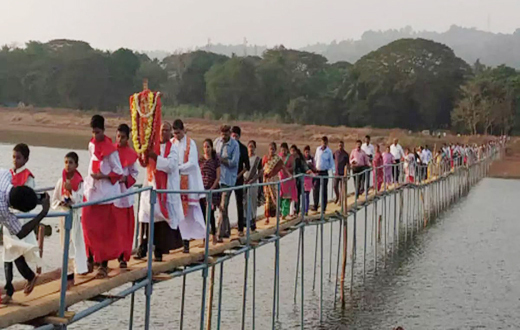 Motivated by the move taken by the Church, the local residents completed 800-metre-long bridge this year at an estimated cost of Rs 18 lakh. Using the iron rods, wooden tow path, the 800-metre-long lock system bridge was constructed. “The bridge can be dismantled at any time,” said Fr Lobo. Tow path: The four-foot wide bridge has no access to vehicles. Last year, sand bags were used instead of wooden tow path. “The bridge cannot be used when there is heavy flow in the river during monsoon. The bridge will be dismantled during monsoon and will be put up again after monsoon,” said Fr Lobo. The residents including women and youth have joined hands to construct the temporary bridge. According to residents, senior citizens, children and youngsters have had to travel to the city for work or to attend classes in schools and colleges. The only Zilla Panchayat Lower Primary School at Pavoor Uliya was closed eight years ago. With no school at elementary level, even tiny tots had to be ferried on boats to schools. With only one boat for service, the school and college going children had to start at 6.30 am itself, the time when boat resumes service.